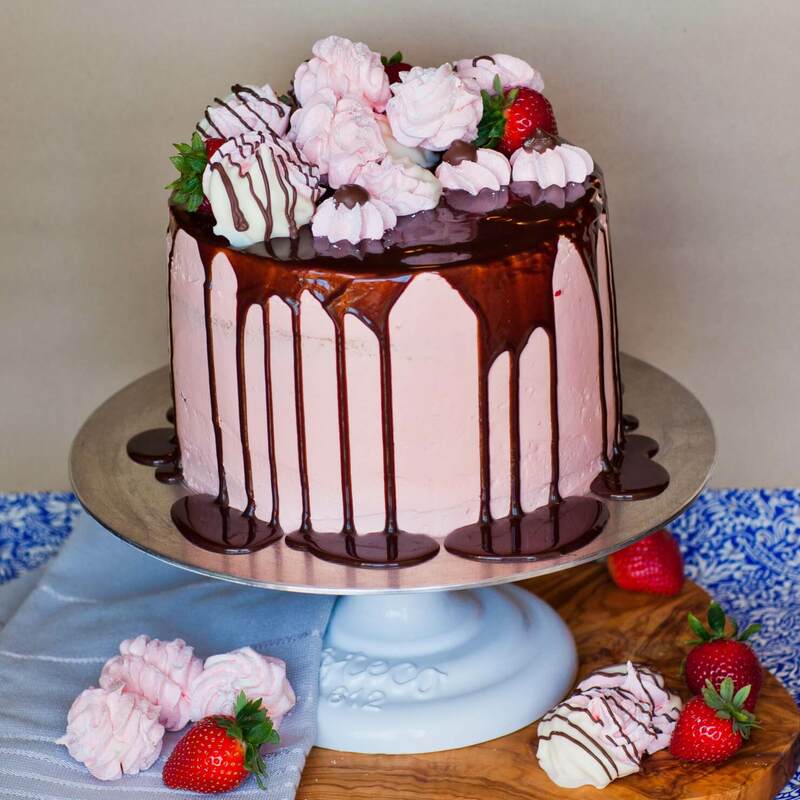 Calling all strawberry lovers – I have just the strawberry cake recipe for you! My Strawberry Marshmallow Cake, aka Russian zefir cake, is the ultimate strawberry dessert! 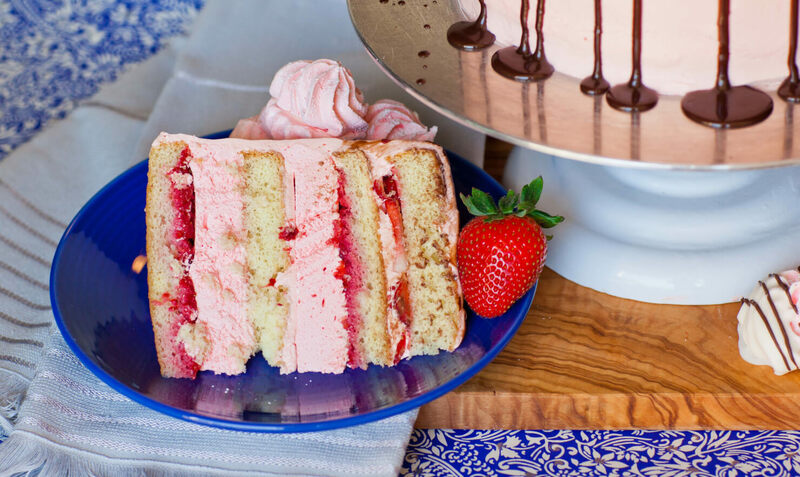 This decadent and stunning cake is made with classic sponge cake layers, melt-in-your-mouth strawberry marshmallow layers, fresh strawberries and of course strawberry buttercream! I garnished the cake with more marshmallow and chocolate ganache. 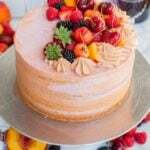 Every bite of this strawberry cake is bursting with berry flavor! Make sure to watch my video recipe to see how zefir is made! 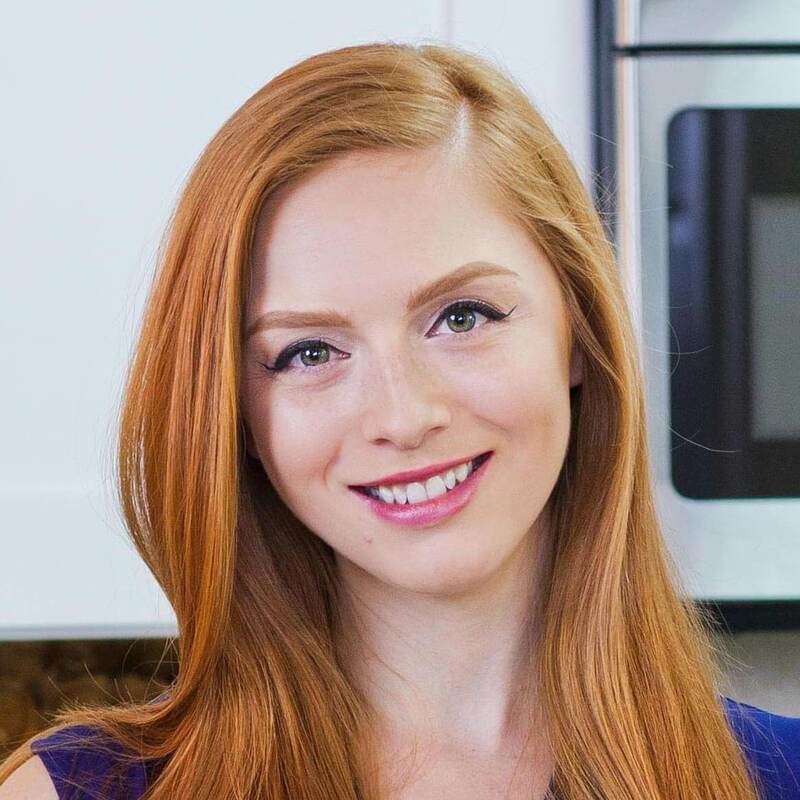 Want new recipe updates? Make sure to subscribe to my YouTube channel to receive email notifications! If you’ve never tried zefir or Russian marshmallow, you are in for a real treat! This meringue marshmallow is like a little bite of heaven – so fluffy, soft and just melts in your mouth. This marshmallow recipe is different from its American cousin because it’s made with agar gelatin. This type of gelatin will set at room temperature, no refrigeration required, at it sets much quicker and firmer than regular gelatin. I have the one I use from Amazon linked below! When making zefir, make sure to follow the sets carefully for best results. The cooking times and measurements need to be accurate for the marshmallow to turn out well. For my strawberry cake, I went with strawberry flavored zefir but it can be made in a large variety of flavors. My other favorites are peach and raspberry. 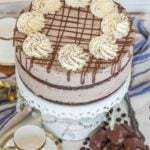 Check out my other zefir cake below! Agar gelatin can be hard to find in stores; I always get this one from Amazon! 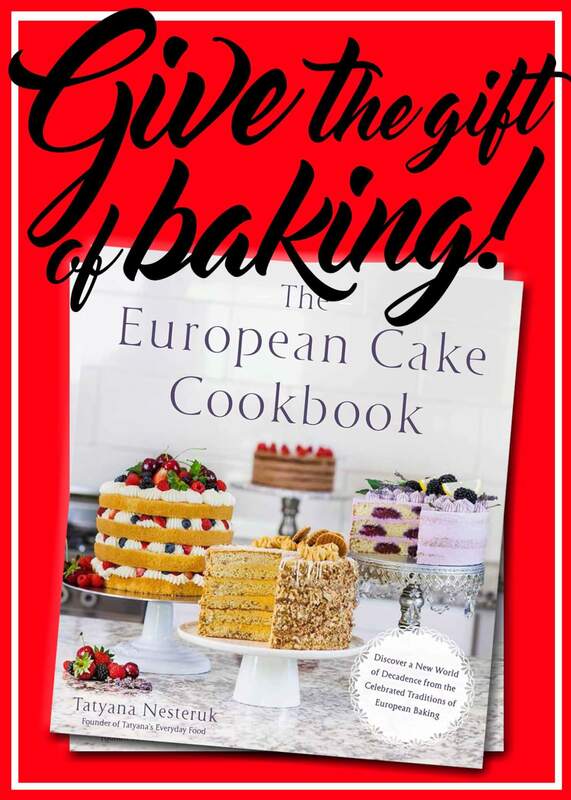 My classic KitchenAid stand mixer is a must for this recipe – it will make the process much faster and easier! I love my classic Ateco turntable for decorating cakes! Use these disposable pastry bags with this set of jumbo cake decorating tips. The sponge cake can be prepared ahead of time or while zefir is setting. Preheat oven to 350F; line 2, 8-inch cake rounds with parchment paper. Place the eggs, sugar and vanilla into stand mixer bowl. Whisk on high speed for 5 to 7 minutes, or until the egg mixture is voluminous, white and ribbons off of whisk attachment. In a separate bowl, combine the flour and baking powder. Sift the dry ingredients into the eggs in small amounts, folding gently but thoroughly after each addition. Divide the batter evenly between the two pans. Bake in preheated oven for 18 to 20 minutes or until golden brown on top. Cool the sponge cake layers completely on wire rack. If making the layers ahead of time, make sure to keep them covered with a clean kitchen towel to avoid drying. Prepare the zefir/marshmallow layers. Prepare the pans first. Line 2, 8-inch rounds with plastic wrap. Also line a few baking sheets with plastic wrap; set aside. Combine 1/4 cup water with the strawberry jello powder. Stir to combine, then microwave in 15 second intervals until the gelatin is completely dissolved; set aside. Pour the remaining 1/2 cup water into a small saucepan and add the agar gelatin. Heat the mixture over medium heat for about 3 minutes, until the mixture starts to thicken and resembles apple sauce. Gradually add in the 2 cups sugar, stirring until it's all combined. Keep cooking the mixture over medium heat until it comes to a simmer. Simmer, not stirring, for 3 minutes. Meanwhile, place the egg whites into stand mixer bowl and whisk on medium speed to soft peak stage. Once sugar and agar syrup is ready, slowly pour it into the egg whites, whisking at the same time. Whisk for about 1 minute, then add the dissolved strawberry jello, lemon juice and a few drops of food coloring. Turn mixer up to high speed and whisk for about 5 to 8 minutes; the meringue will start to cool down, begin to thicken and pull away from the sides of the mixing bowl. Work quickly as the marshmallow sets fast. 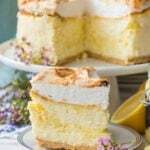 Spread the meringue into the prepared 8-inch cake rounds, creating 1-inch thick layers. Use an off-set spatula to level off the top. Transfer the remaining meringue into a pastry bag (I used tip #847) and pipe onto prepared baking sheets; the marshmallow size is up to you. Sprinkle the tops of the marshmallows/zefir with confectioner's sugar. Set it aside for at least 1 hour, or overnight, to set. The longer it sets, the crispier the outside will become. Prepare the buttercream. 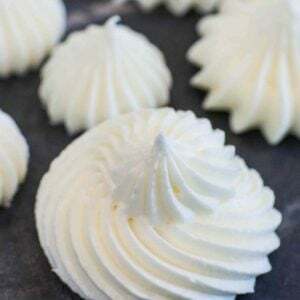 Place softened butter into a mixer bowl and whisk until light and fluffy. Add the confectioner's sugar and strawberry emulsion (can also use extract with a few drops of red food coloring). Whisk on high speed until light and fluffy. Prepare the strawberry filling. Place strawberries into a large bowl and crush using a masher or a large fork. Assembling the cake: split the cooled sponge cake layers in half, creating 4 layers total. Spread strawberry puree onto the first layer. Remove the zefir layer from the pan and invert on the sponge cake layer, removing the plastic wrap. 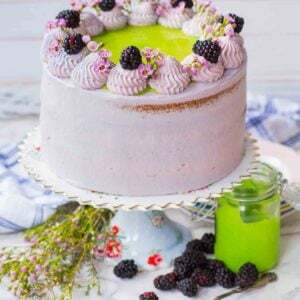 Spread with butter cream and continue assembling the cake, alternating with sponge cake, strawberries and zefir. 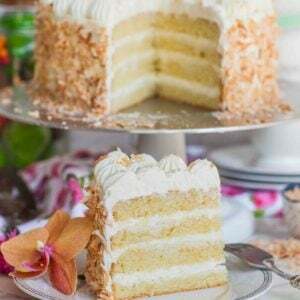 Cover the outside of the cake with butter cream and smooth down sides with a flat spatula. Set the cake into the refrigerator to set for 30 minutes. Prepare the chocolate ganache. Heat the heavy cream until steaming hot (not boiling!). Add the chocolate melts/chips and stir until the ganache is smooth. Allow it to cool slightly before pouring over the top of the cake. Garnish the top of the cake with fresh strawberries and zefir dipped in chocolate. Keep any remaining zefir covered in an airtight container; it can stand for up to 1 week, no refrigeration needed. 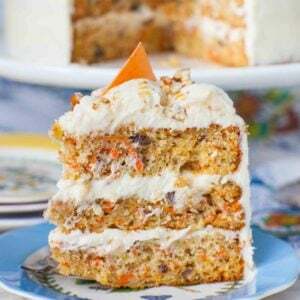 Refrigerate cake; remove 1 hour prior to serving to allow the butter cream to soften. Can I use Knox unflavoured Gelatin instead of agar gelatin for Strawberry Marshmallow/Zefir? 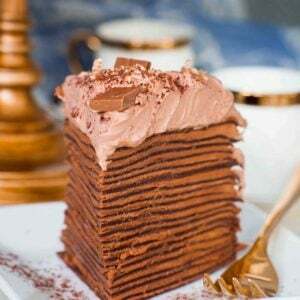 This cake looks amazing! I was wondering when you cook the agar gelatin and then mix it with egg white, does that cook them? 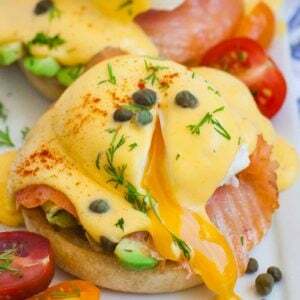 I’m trying to stay away from raw foods and was wondering about the egg..
Where do u buy straberry emulsion or extract im in store cant find it?? Can i use the agar- agar powder? I can’t use the strawberry jello powder because I’m allergic to gelatin. Can I just substitute it with strawberry extract, agar, sugar, and some water? If not, how would I substitute it? Hi, I just tried the recipe and replaced the jello with strawberry purée but it didn’t thicken Iike yours. When I was dissolving the agar in the water, it didn’t resemble applesauce but I went ahead and added the sugar in anyway because it had already been simmering for 5 mins. Do you know why it didn’t thicken? Hmm, did you use powdered agar gelatin? I know there are few different types. The other problem could be the strawberry puree. The jello also contains gelatin, which further helps set the marshmallow. If you want to use strawberry puree, you will need to increase the amount of agar. Is agar-agar powder the same as agar gelatin? Also, do you think the marshmallow will hold up in a 2 tier wedding cake for several hours at an outdoor wedding? Yes, one and the same! 🙂 Yes, the zefir/marshmallow layer will set up and it doesn’t melt because the agar sets it firmly. I would like to make a less sweet marshmallow, if I reduce the amount of sugar will it affect how the marshmallow turn out? Or it will ruin it? 🙂 Thanks! I recommend staying with the same amount of sugar; the syrup is what helps transform the egg whites into a stable marshmallow. If I wanted to make the same cake but do peach zefir instead of strawberry could I just substitute strawberry jello for peach? Hi Tatyana! Thank you for sharing your recipes. My water and agar mixture did not become applesauce like. Does the agar gelatin need to sit in cold water a little before putting on medium heat? Also does it need to be mixed once on medium heat or wait until it acquires applesauce consistency before stirring? Purchased agar gelatin from link on uiir site. Thank you! I just discovered zefir and I’m in love. I love watching the pink fluff just grow in my mixer. I made a batch with raspberry jello, and I’m wondering – does the gelatin/ agar combination produce a different texture than your peach zefir pops, which are flavored with natural peach juice? Hi Ally! Isn’t it the best?! I love zefir, too! I do notice a slight difference in texture when using the gelatin/agar combo versus using just agar. I think that little bit of gelatin helps to further set the zefir. Tonichka loved this cake. It was amazing. My only ? Is do u no how much in advance I can make this one with out it getting all soggy and rune the zefir? I’m so glad you enjoyed the recipe! 🙂 It should be just for at least 2 days in the refrigerator. If you want to make it ahead of time, I would omit the fresh strawberries and just use strawberry jam. The fresh strawberries would ruin if they stand for too long and leak berry juice everywhere.